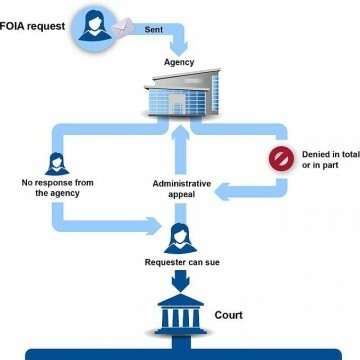 Brad Heath, an investigative reporter and editor at USA Today, knows there are some Freedom of Information Act requests that he really cares about – and others not so much. “Sometimes a FOIA is shooting a cannon down a dark hallway to see if it hits something,” he said. Heath (bio, Twitter) has made a career out of using FOIA to mine records for stories both big and small. In a session with Paul Miller fellows, Heath described how FOIA works, as well as how he works FOIA. It’s routine for Heath to file a FOIA a day. It’s not unusual for him to file two. And these aren’t generally massive requests for piles of internal documents, years’ worth of emails, or major databases. Sometimes these are targeted shots related to something in the news that day – a quick request for a record or two that could help flesh out a story. Sometimes the records come back and Heath will have himself a little scoop. Sometimes they don’t – and Heath will have a story about a federal agency denying the public’s right to public records. For the requests that are initial fishing expeditions, use language that’s broad enough to include any relevant material: “any memos, emails, guidance or other instructions” about a specific issue. That’s targeted to a specific issue but broad enough to vacuum in a lot of potentially helpful material. For the requests you are really hoping for a quick response, be as specific as possible, giving exact dates or authors of the reports, emails or memos in question. Look for stories about what wasn’t For example, Heath filed a FOIA for copies of any investigations about a Department of Justice issue and discovered ethics officials had never even looked into the complaints at the heart of the issue. Heath also discussed the appeals process, and gave tips on how to properly craft the letter if your request has been improperly denied.